What is the smallest detail of the lunar surface can I get with a 80mm telescope (600mm focal length) and Canon 10.1Mpixel camera? Matching some of the smaller craters in a Moon atlas gives me roughly 6-8km/pixel. But with image processing anything below 10km doesn’t really show or will blur in the noise. I tagged a few geological features and dimensioned two craters for reference. At the same time identified the approximate Apollo 11 and 17 landing sites. The Apollo Lunar module is only 9.4m wide, hence it is impossible for any Earth bound telescope can possibly pick them up (even Hubble). However the Lunar Reconnaissance Orbiter (LRO) did manage to pull it off by lowering its orbit as low as 50km above the lunar surface. My original photo of the Moon. 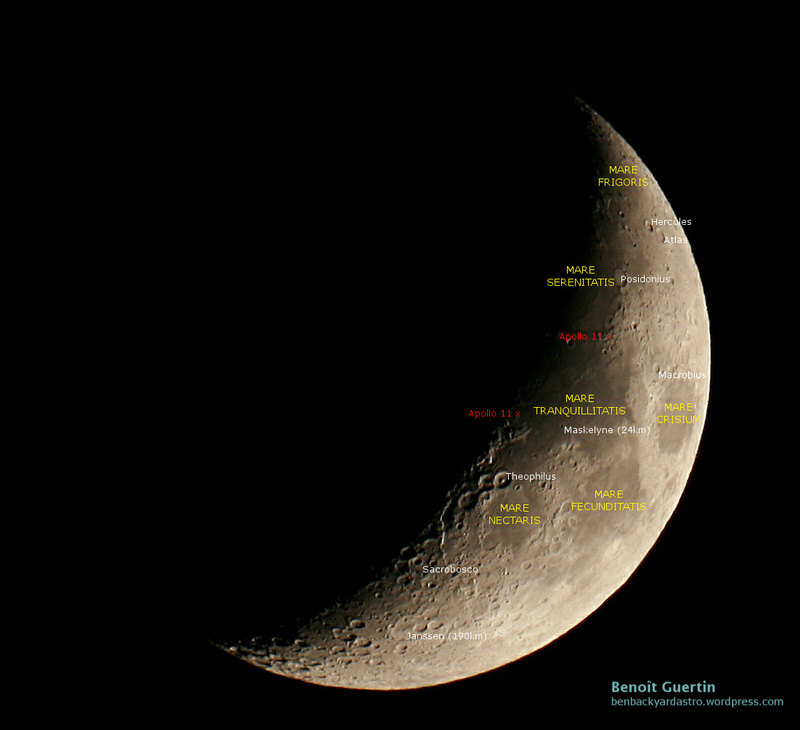 This entry was posted in Photo, Science and tagged Apollo, Astronomy, Astrophoto, Astrophotography, Moon, Telescope by Benoit Guertin. Bookmark the permalink.